Allow me to share with you one of my favorite apps in all of Apple’s App Store: TonePad. You see, I’ve been intrigued by the elusive (and expensive) “visual music composition device” known as Tenori-on since I first heard about it a couple years ago. And since I don’t have the time to make the most of a thousand dollar diversionary investment like the Tenori-on, only an intrigue it has remained. Which is why I took notice when I first read about TonePad, an app for iPhone/iPod Touch that replicates a part of the Tenori-on concept. And since downloading it, I can’t stop making minimalistic, dreamy tunes with it. Usage is straightforward and simple. On launching the app, the user is presented with a 16 x 16 grid of dots, where the rows represent the beats and the columns represent 16 tones, with higher pitches at the top of the grid. Press a dot to activate that particular note and each time the measure loops to that beat, a tone is played. For visual feedback, each dot pulses as it is played. Combine dots into chords and melodies, and voila, you’re making music. The tones themselves are pleasant, with a small reverb applied, making it hard to create a “bad” song. Sure, swiping a finger across the interface may not make for the most compelling of compositions, but it certainly doesn’t create the mess that mashing a keyboard or piano does. As fun as TonePad is though, it does suffer from some limitations. For one, the composition options are fixed. The tempo, time signature and tone are set to a default, and on a default they must stay. You can’t make the loop any faster or slower, or change the number of beats in the measure or change the basic sound of the tone (or make it another sound entirely). Also, you’re limited to working within just the one loop. It would be pretty nice to be able to set up a loop and have it continue to play as you put together another loop to layer on top (and it would be especially nice to do it with different base tones). Finally, and this one can’t really be helped, but the dots are small enough that they can be troublesome to accurately press. There have been a number of times when I wanted to turn one off and ended up turning the neighbors on. But hey, I’m not really complaining. TonePad is both fun and free and a worthy app to carry in one’s pocket. Apple unleashed iTunes 7.4.2 today, mostly to cripple efforts by the iPhone community to customize their ringtones without having to pay an additional $.99 to do so. On that topic, one could argue that users are well within their Fair Use rights to repurpose (format shift) into a ringtone the music they’ve already paid for. I’m not an iPhone user nor do I intend to be, so it’s purely an academic observation in my case. My slightly modified Motorola E815 lets me copy mp3s over Bluetooth and use those as ringtones. it’s quite convenient. But I digress. The important news is that 7.4.2 in no way fixes the asinine sorting problems introduced in version 7.3. iLounge offers up some polite criticism in addition to my own. Unfortunately, this “numbers-last” sorting order is counter-intuitive to how most other software applications function. Other media players, be they portable devices or computer software applications, have always taken a numbers-first approach, as do standard sorting algorithms in Word Processing and Spreadsheet applications. In short, this new behavior is extremely counter-intuitive to what most experienced users would expect, and as a result is a rather odd change on the part of iTunes. This is going to be a hot topic around here until the day it gets resolved. If you’re as sick of hearing about it as I am of complaining about it, let’s encourage Apple to mend its ways. Weeeee… new toys from Apple! iPods iPods iPods, including shuffles in drab new colors (gimme orange), a new iPod NanoVideo (aka iPod Squat), an all-metal iPod Classic (the form we all know and love––now up to 160GB!) and a phoneless iPhone (aka iPod Touch). Upon the availing of the line up this afternoon, I was immediately torn. In my mind, the iPod brand is essentially “a bajillion songs in your freakin’ pocket––more songs than you could ever practically listen to but who cares because it’s a bajillion songs! In your pocket! !” and the upgraded 160GB model is encoding a lot of digital saliva in tunequestland. The iPod has finally caught up to the point where I could realize the dream of fitting my entire library (all bajillion songs of it) onto a single portable device and that sounds like a lot of fun. But Apple had to go ahead and simultaneously release that little portable wi-fi web browsing internet communication device, didn’t they? More than anything since the iPhone was announced in January, the prospect of in-your-pocket internet has been very appealing. But of course, I already have a phone that does everything I need a phone to do, so I wasn’t (and still am not) about to plunk down for the device. At the time I thought that if Apple wanted to unbundle the phone from the package, great, I’d look at it then. And Apple has done just that with the iPod Touch and that is the source of my quandary. The storage capacity of the iPod Touch’s models is 8GB and 16GB, a major step down from what I’m used to. While I did fine for years with a 15GB model, I’ve gotten accustomed to lugging around roughly 40-50 gigs of music, podcasts, audiobooks, courses from iTunes U, videos, photos and data at any given time. The thought of having to cram all that back to 16GB or gasp!, 8GB, is anathema to my idea of what an iPod is. I’m still quite happy with my 80GB 5.5G model. I’ve had it for almost a year and the only major disappointment I have with it is my recently discovered long audiobook problem. I’ve been especially surprised by the durability of its screen. It’s not had any kind of protector and there’s nary a sign of a scratch or mark. While the idea of a 160GB iPod Classic is a very compelling dream, I’m more than happy to continue using my existing hardware as my workhorse iPod. But… what if I were to simply use an iPod Touch almost exclusively as an internet device, saving most of the traditional iPod functions for my 80GB? That would be the ticket. And for a moment, with the Reality Distortion Field set to maximum capacity, I seriously considered that option. Then I quickly came to my senses. I’ve tried managing multiple iPods for different purposes and it’s just too much effort. For a while, I tried to divvy up music and spoken audio (podcasts, books, etc) between two devices and invariably, I’d find that I didn’t have the one I wanted at the moment I wanted it. Then there was the hassle of keeping them both synced, updated and charged. Before too long, I abandoned that idea. Besides, when one device can do most or all of what you want it to, there’s really not much point to segregating the duties. And the more I think about it, the less certain I become that I’d actually find a significant use for an iPod Touch. My multimedia needs are already handled by my 80GB and the vast majority of my wi-fi usage is done in my house, where there are four computers I have access to. Furthermore, based on the images at apple.com, I don’t see icons for some of the traditional “Extras” provided on the iPod’s interface, like Games and Notes (though I wouldn’t imagine that they’ve actual been removed). And where’s the note taking program to make use of that famous multi-touch interface? Other than for novelty, I can’t really see myself getting one, that is, until the storage is increased. Though that might change if it turns out the the Touch has inherited the iPhone’s PDF-reading capabilities. I’ve been wanting to make those portable documents truly portable. But for now, the bottom line: I’m happy with what I got. Of course, for me, this all a moot discussion unless iTunes 7.4 fixes 7.3’s horrible sorting problems, which, at first glance it doesn’t. PS- Did anyone else notice that Music and iTunes are separate selectors on the Touch? I realize that using the term “iTunes” is Apple’s way of differentiating pre-loaded music from on-the-go purchasing, but it strikes me that that this could be a subtle shift in the iTunes branding away from the “your personal jukebox” function and toward the store aspects. If you look at Apple’s various iTunes pages, you’ll see that the money-making features are more prominently displayed. Apple has really screwed up with the new sorting behaviors introduced in iTunes 7.3 and it’s making a lot of people seriously unhappy. And, honestly, I’ve NEVER been mad at Apple for anything in my 25+ years of history with the company (annoyed at times, but never mad), but the more I think about this the more pissed I get. For those just joining the story, Apple released version 7.3 to accompany the launch of the iPhone. Included in that release was a new, completely arbitrary rule set for sorting Artist, Album, Composer, Genre, etc tags. Starting with version 7.3, numbers and other non-alphabetic characters are sorted to the bottom of the list. My default view now shows Aalborg Symphony Orchestra at the top. 2pac now begins after the Zs and iTunes suddenly doesn’t even know how to handle artists whose names begin with punctuation. It starts !!! after songs that don’t have anything entered into their Artist or Album tags! iTunes now ignores the non-alphabetic leading characters and sorts based on the first letter or number it finds in the name. The program now treats fields that are all punctuation as if they are blank, as if they have nothing typed in at all. And guess what else? It passes that behavior to the iPod. At first, it seemed that the issue was a bug, but as revisions came out, it became clear that this new behavior was intentional. Indeed, an Apple support document created July 11, 2007, explains the new scheme as if everything is hunky-dory. The odd thing about this is that there is no rational explanation for it. Before 7.3, iTunes used case-insensitive ACSII as its basis. It’s a decades old standard that all electronic devices use. Symbols > Numbers > Letters. That’s the order the entire Western world has been using for all of modern memory. Look on any computer’s desktop and that’s how you’ll see files arranged. Hell, even the 131-years-old Dewey Decimal System sorts numbers before letters. Perhaps more bizarrely though, is that this behavior only appears to affect the first character in the music tags. Playlists and second character sorting (unless the whole field is made of punctuation) still seem to use the ASCII method. Say whaa? If you’re going to screw up a standard, you might as well be consistent with your screwery. Seriously, this abrupt abandoning of established convention brings Apple closer to Microsoft’s behavior regarding standards. Could you imagine if, on a whim, Apple suddenly changed the way Safari renders web pages to its own specifications, rather than W3C standards, perhaps in order to accommodate the iPhone? That’s how bad this is. So far, the suggested workaround is to use the Apply Sort Field command to manually restore normal sorting, a process that is cumbersome, tedious, counter-intuitive and shouldn’t even be necessary. In my case, I’d have to apply it to 150-200 albums and gobs of composers and I’m not about to waste my time doing so. Alternately, you can downgrade to iTunes 7.2. I am not alone in my ire. Others in the passionate-about-iTunes community are equally upset at this development. Here’s some choice reactions from several threads around the net. It’s not just a “strange” decision, but a downright moronic one. First off, anybody bright enough to use a computer knows that symbols and numbers sort before alphabetical characters. Second off, what was the whole point of introducing the ability to customize sorting in 7.2 if they were just going to turn around and bork it with 7.3? Thanks. I am familiar with all the suggested workarounds. I’m extremely irritated that the numbers vs. letters order has changed. This has messed up with my established order for albums that I was very pleased with. they have changed the Digit order, when you sort column be accending, so all those people who had there music sorted by Artist with bands like +44, 65 Days of Static and 30 seconds to Mars ect… will now find that in that mode they are liseted at the bottom after your XY and Z’s (if you have any) Thats just annoying, why the change? The sorting in iTunes 7.3 is totaly screwed. Apparently numbers now come after letters. This was by far the most annoying thing in the update. Brackets and parentheses are ignored in sorting, too! well, I did notice that the sorting on the iPod is the same way. Numbers come after letters. The numbers after letters thing is what really gets me. It’s completely f’ed my entire library. The 7.3 update is what caused the error in sorting (numbers and symbols after z.) I was hoping the 7.3.1 update would fix it, but it sounds like it doesn’t. not sure if anyone else has noticed this, but when I opened iTunes back up after the update I noticed that all of my artists that are a # (IE: 311, 3 Doors Down) are all now at the end of the iTunes artist sort rather than being at the top, before the A’s like it used to be. anyone know of a way to change this back? is there anything like how you can either view you contacts in address book for first, last or last, first? just wondering. I downgraded my iTunes to 7.2 for the time being. Dear $deity why? Why would they do that? Everybody knows its punctuation->[0-9]->[Aa-Zz], anything else is heresy! And so on. I’ll add more as I run across them. For now, the only way to get “standards compliant” sorting back is to downgrade to iTunes 7.2. I’ve done this already and until I see a version that restores standard procedure (or at the very least offers the option of using either scheme), I will not be upgrading to any future version of the software. That basically means I’ll never buy an iPhone or any other product that requires a subsequent version of iTunes. I’ll probably save myself some money that way. If you don’t have an iPhone, I suggest that you do the same. Download for Mac. Download for Windows. Links to interesting stories. This edition is long overdue. I love eMusic. At ~$0.25 per song, it’s easily one of the best values in the digital download arena. While generally functional, parts of the site could use some overhauling. Medialoper leads the discussion on how. The band was originally called Cherry, but there was conflict with other bands using the same name so we had to change it. We just sat down and brainstormed for a few days. It was slow going, but then the name just popped into my head and it was the first idea we’d had that we didn’t absolutely hate. After a while we even started to LIKE it. Now I really like the name Ratatat and I don’t like Cherry much anymore. Cherry” made us sound like sissies! “Ratatat” makes us sound tough, right? A series of anecdotes about the various licensing deals a number of artists have entered into and the effect those deals have had on their careers. A lot of people claim that they can’t hear the difference between a 128kbps file and a 256kbps file. This video proves that there is indeed a difference. I think every English speaking person in the world should read this story all the way to the end. It’s a life-changing experience. After you’ve finished, you’ll probably want to die, or kill, or both. Have a non-iPhone phone or PDA with audio capabilities? Out-of-the-box, iTunes doesn’t offer much in the way of getting audio files onto them. SyncTunes however, might be your savior. And finally, a RatingQuest update: As of 8/25 6:30PM EDT, I have rated 8,050 out of the 15,865 songs in my iTunes library. That’s 50.7% completion, a 2.6% increase from when I started. Webomatica chronicles the hoopla as the launch of the iPhone approaches. Antics include people paying other people to stand in line, christening June 29 as “iDay,” and links to major newspaper reviews. A number of audiobooks were sold at the iTunes Store recently that didn’t work on the iPod. That problem has been fixed. Speaking of the iTunes Store, these two links will take you to free downloads from it: Link one. Link two. Here are some tips for getting the most out of a Netflix subscription. Speaking of Netflix, Internet Zillionaire confesses the irrational lengths passionate Netflix users can go to in their efforts “to scam, scrimp, rob, cheat, copy, burn, and screw over” the service. Comparative results from running Geekbench on every Mac released since the slot-load iMac (400Mhz G3 from October 1999). My Intel iMac at home scores a 2338 while my G5 PowerMac at the office scores a 2108. My PowerBook G4 scores a lowly 692. Electric, battery-powered lawnmowers reviewed by Wired. I have a Black & Decker model and I love it. No gas. No oil. No spark plugs. No exhaust. Push-button start and enough juice to cover my entire yard (front and back) in one go. The best part: I got it for a third the price on eBay. Star Wars fans hate Star Wars. This pretty much sums it up. Personally, I think that, as a story, Star Wars is so poorly thought out, written and executed, if it weren’t for John Williams creating an emotional connection through his superb music, the original film would have flopped. Or, at best, it might have attained underground cult status a la Planet of the Apes or Logan’s Run. Oh hey, here’s a Velocity Girl video, I Can’t Stop Smiling. It’s an excellent song. What might happen if Cisco and Apple in up in the courtroom? Leaving aside for the time being that “iPhone” is a pretty weak name for a product that’s much more than a simple phone, it does appear that Cisco has been the proper registrant of the iPhone trademark since 2000. Based on my understanding of trademark law (note: not a lawyer), there’s no legal mechanism for Apple to seize the mark for itself. However, Apple’s argument seems to be that the product category of cell phone is sufficiently different from Cisco’s offerings that it’s not infringing at all. That’s the reason why Dodge Viper and Viper car alarms co-exist peacefully, even though they exist in the same industry. However, considering that the iPhone is more than just a cell phone (revolutionary communications device that uses WiFi and IP when available) I’m not sure a judge would agree with that claim. In this situation, the court decides that the products are not enough alike and Apple’s use of the name does not constitute infringement of Cisco’s trademark. Both companies can then legally use the same name on different types of products. Cisco cries a bit and is prevented from offering a product similar to Apple’s iPhone. The reverse happens. The distinction between the products is held to be too fine and the iPhone name is deemed to be exclusively Cisco’s mark. The company is possibly awarded damages. Apple then has to negotiate for use of the name, or rename its product. Wired Pete at Cult of Mac makes the argument that because “the public,” after months of speculation and fantasizing, already identifies the iPhone name with Apple. One could make the argument that the incredibly small portion of the general population that trades rumors about future Apple products hardly makes up “the public,” but lets run with it. Popular sentiment would not be sufficient grounds to award an exclusive trademark to Apple. In this case, a judge could rule that the trademark is now too diluted and generic for any one entity to own. “iPhone” would then mean “any kind of internet-enable communication appliance” not any one specific device. Apple is not likely to argue this. “iPhone” would not mean much to the company then and any other company could release a similar product with the same name. Plus, it could lay the groundwork that i- product names in general are too generic to trademark protection. Admittedly, that’s my largest legal stretch, but once again: not a lawyer. Feel free to debate it though. But that all just fun speculation. This is not likely going to make it to court, but it is providing a lot of press for both companies. That’s my take. Feel free to kick it around. Update Jan14: Check this post at TechnicallyTrue for lots of deep background on the iPhone fight. So the mythical iPhone was unveiled yesterday and by all accounts, it is a revolutionary communications and portable computer device. The user interface alone is light years ahead of anything else on the market. And the technology behind it really looks phenomenal… for a phone. But even with all that legendary RDF action in effect, my own reaction is surprisingly lukewarm. Bias Alert! : I abhor the telephone in general and mostly use a cell phone for short calls to my wife. On most days, I don’t use the phone at all. So that aspect of the device is rather immaterial to me at this time. If I didn’t already have a cell phone, that feature would be a nice perk. As a portable computing and communication device, the thing looks awesome. When I think of it as a portable computer the $499 price tag doesn’t seem as bad just a little bad, even though it’s not a “full computer,” being currently limited to the apps provided. Constant web connectivity would be great for looking up info at any given moment, whether it’s looking up traffic while already on the road, settling disputes at the bar, or checking the Scrabble database of words. The ability to live-blog an event with pictures is revolutionary. Some questions though. Can it print? Will the device detect a bluetooth printer and allow me to print an email, text message, map or photo? Can I network with computers and other iPhones on the same LAN via WiFi? I know I can text message and send email, but can I type up quick reminders and notes and transfer them between computers. Can I copy files to it directly without having to email? A GPS receiver plugged into the dock connector would be a killer app. And a PDF reader for ebooks would be, quote, da bomb. Ironically though, the thing that bothers me about the iPhone, is its branding as an iPod successor. With its current storage capacity, the device takes us back five years, while trying to perform many more functions. The iPod’s ability to hold mass quantities of songs (and now videos) while also being usable as a portable hard drive are the two greatest features of the iPod line (the full size models anyway). The iPhone minimizes those functions. The argument can be made that it’s impractical to listen to 30GB of music, but that’s not the point. The point is choice. I like being able to keep a large number of playlists synced up and ready to go, depending on my mood, at the push of a button. Alternately, it’s fun to press play and not know what I’m going to get. Then there’s the fact that I use my iPod to cart large files between home and the office as well as store copies of projects I’m working on so I can pick up from whatever computer I may be near. And 4GB is laughably small when thinking about full-length movies and TV shows. So that aspect of the iPhone leaves me non-plussed. 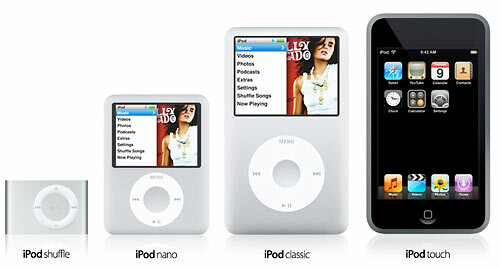 However, I tend to agree that the concept of the iPod proper maybe near the end of its evolution. The form factor seems to be at the limit of what it can do with the only potential improvements being increases in hard drive size. Now if the iPhone can stream music to an Airport Express, then we might talk. Which leads to another thought: an iPod HiFi with built-in 802.11 wireless, WiFiHiFi anyone?, to receive music from an iPhone or any wireless equipped computer with iTunes. That would be rad. Until then, I think the 80 gigs in my pocket will do just fine.